Through the Light of Knowledge Project (Projeto Luz do Saber), young and old people alike have the opportunity to learn to read and write using computer software. (Cuiabá – MT). Photo: Claudio Oliveira. Among other beneficent activities, the Beneficent Spiritist Center União do Vegetal has literacy and digital inclusion of young people and adults as a priority. Since 2002, more than five thousand people have passed through the classrooms (computer labs) of the Light of Knowledge Project (previously named the Light of the Letters) to learn how to read, write, and to use the computer as a tool of citizenship. 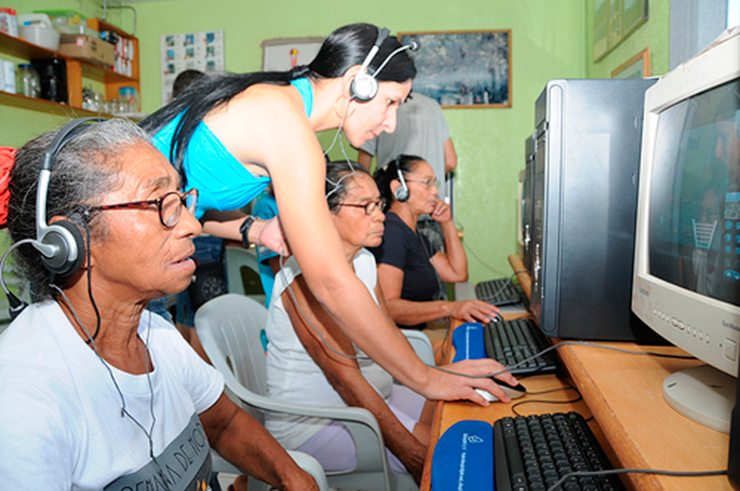 In 2010, a new software program was developed – the Light of Knowledge – the result of a partnership between the Beneficent Association Casa da União (an assistive branch of the UDV) together with the Casa Brasil (from the Presidency of the Republic) and the Department of Education of the State of Ceará. The software program is free for distribution and open source, and can be adapted and improved in accordance with the specifications of the public. The methodology was based on the theory of educator Paulo Freire. Easy to use, the Light of Knowledge is available on the internet, to download or to use online via the website of the Department of Education of the State of Ceará. It can be used at home and in schools, and for both child and adult education. For the União do Vegetal, the Light of Knowledge Project is a form of human advancement, offering wide access to literacy and digital inclusion. In 2014, through the always voluntary service of its members, the UDV supported or fostered the organization of literacy labs in nine cities: Alta Floresta and Cuiabá (MT); Campo Grande (MS); Criciúma and Florianópolis (SC); Ilhéus (BA); Belo Horizonte and Ipatinga (MG); and Rio de Janeiro (RJ).